Both of Emily’s parents are killed when the nuclear power plant they work at has a catastrophic accident. Everyone assumes it was her father’s fault since he was in charge so Emily runs away to avoid their wrath. Emily’s a bright girl and is passionate about the work of Emily Dickinson but she’s led a privileged life so it’s hard to imagine her on her own. Emily’s tough, though, and manages to survive even though she misses her parents and dog. She uses her wits but still finds herself in some bad situations. When she comes across a young boy who’s in worse shape than she is, she does everything she can to protect him. 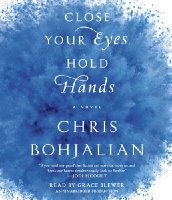 I’ve read, and enjoyed a couple of Chris Bohjalian‘s books in the past so I was really excited to read Close Your Eyes, Hold Hands. I liked this book a lot but I didn’t quite love it and I’m not totally sure why. I thought Bohjalian nailed the voice of a teen-aged girl and I loved the way he incorporated her love of poetry into the book but, somehow, I never felt fully immersed in the story. I think the book lacked the emotion I was looking for but I definitely think it’s worth reading. The audio version of Close Your Eyes, Hold Hands is narrated by Bohjalian’s daughter, Grace Blewer. It took me a while to get used to her narration but, once I did, I thought she did an okay job. The audio book is on 7 CDs and lasts approximately 8 and a half hours. I too have read many of Chris Bohjalian’s books, and I thought this was one of his best ones yet. I’ve enjoyed a few of his previous books but for some reason I haven’t been drawn to this novel. The reviews I’ve read have gone from just ok to fantastic so I’m not surprised by your opinion. It’s sad when we don’t “feel” for a book the way we want or thought we would. I love this author but mostly because he is just so good to his readers and very accessible. I have this book. I must say, the premise sounds a little strange but I am willing to give it a read. I have enjoyed some of his books and they’ve been interesting to discuss with others. I am a huge fan of this author from way back when I read Midwives. Some of his books are lesser favorites than others, but I enjoy them all. I can understand you not connecting with the main character and that will color your enjoyment of the story. I didn’t listen to it, I read the e-book arc, but I did think it was a good read and recommended it to most. I’ve enjoyed a few of his earlier books, but this one doesn’t appeal to me. Kathy, thanks for your honest review. I know many enjoy the work of this author. I had some trouble listening to the audio, which kept stopping (it may have been my computer or faulty internet connection). I have somehow missed this book by Bohjalian. Sounds fascinating – I need to look for it. I really enjoyed Night Strangers, but this seems to have a completely different feel to it. I may give it a shot. I have this one to start yet! I read this one and liked it a lot (mainly because I really liked Emily Sheppard), but I agree that it’s really different from his previous work. I read this one a few weeks ago and totally forgot to review it. I think I enjoyed this one a bit more than you did. I’ve read a few books by this author, but for some reason this one didn’t capture my attention. I’ve read almost all of Bohjalian’s boooks (I grew up in VT which is where he lives), and I’ve liked some more than others. My favorite is still Midwives, but I really liked this one. Part of it may have been the VT references, but I did find myself worrying about what happened to Emily after the book ends, which for me, is one of the signs of a good book. I liked this book very much. Perhaps it was just Emily’s voice that grabbed me. I find each of his books so unique that it’s hard to love them all. I still haven’t read anything by him. I have a copy of this one in audio and I didn’t realize the narrator was the author’s daughter. I’ve heard such good things about this book! Your callout about the lack of emotion does give me pause though. How interesting that his daughter did the audio! It takes a special talent to pull off narrating. I liked this one a lot – probably more than you did. I agree that he did a good job making me believe the story came from a teenage girl. The only one of his I’ve read is Midwives but I have all the rest on my TBR list, including this one! I will skip the audio version, I think. This book totally broke my heart. I’m sorry that you didn’t love it as much as I did. Wow that’s brave that the daughter read the audio book. That must be rare for an author, right?